In a pinch for the holiday cookie exchange and need a quick and fabulous idea? Want a treat that’s easy to make in the RV? 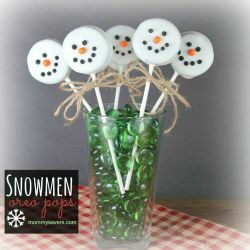 Just looking for a fun holiday treat idea to do with the kids? Here’s your easy way out with no baking required! I saw a picture of these on Pinterest, followed the recipe link to www.mommysavers.com, and decided to make them with my family last weekend. Ever so gently (I’m going to say that a lot here… those suckers break easily! ), take the Oreo cookie apart. I found that gently spinning the outer cookie layers worked pretty well. Take them all apart and lay them out on your counter or on a cookie sheet or tray of some kind. Then, use the cake pop stick to gently dig a little “tunnel” through the filling from the outside edge to about the middle. You will then lay the stick in the little tunnel. Melt your vanilla candy and put a little dab on the center of the cookie that has no filling on it, and place it on top of it’s other half. Press it down gently and allow it to set. Repeat for all of your cookies. If you have breakage, and I had quite a bit, don’t fret, you can salvage them! If they break into relatively large even pieces, just use a little bit of your melted candy to “glue” them back together. No one will know because you’re going to dip the entire thing in melted candy and cover it anyway. Make sure your candy is nice and warm and melty, and this means you may need to reheat it periodically. Dip each cookie and swirl it around so that it is evenly coated. If you are having a problem with the cookie sliding off or breaking while dipping, try holding the cookie and stick still and using a spoon to drizzle and pour the the melted candy over the cookie instead. Tap it gently – ever so gently to remove excess, and lay it on parchment paper to dry. Once it is a little set up, but not all the way dry, press in half of a Tic-Tac for the nose and allow to dry completely. Then you can finish it off by making the eyes and mouth with the black icing. So easy and super delicious! You can wrap them in little cellophane bags and tie them up with a pretty string for gifting.